Expand two – 12 kV Switchgear stations. The MCAS – Cherry Point has a 12 kV Distribution System with two Points of Delivery from Progress Energy. The system is made up of two 12 kV overhead substations at the Points of Delivery and eight 12 kV sectionalizing stations consisting of outdoor switchgear cabinets. Demolition of the obsolete wood pole structure Substation 1 rebuilding the station with steel structures and new feeder breakers. Change out obsolete electromechanical relays in Substations 1 and 2; and Sectionalizing Stations A, B, C, D, E, F, G, and H with approximately eighty SEL-microprocessor relays. Replacement of obsolete air break circuit breakers in Sectionalizing Station E with vacuum breakers. Addition of two breakers in Sectionalizing Station H.
Design, installation, and programming of a SCADA system. Design of a fiber optic communication network for the SCADA system. This project includes a 500/23 kV substation with a 1000 MVA, 500/230 kV transformer bank, 230 kV ring bus, two 230 kV capacitors banks and a bundled 1590 kc-mil 230 kV transmission line (ultimately two 230 kV lines). The project also includes a 230 kV plant switchyard for three 200 MW gas fired turbine generators with provisions to expand to seven 200 MW generators. 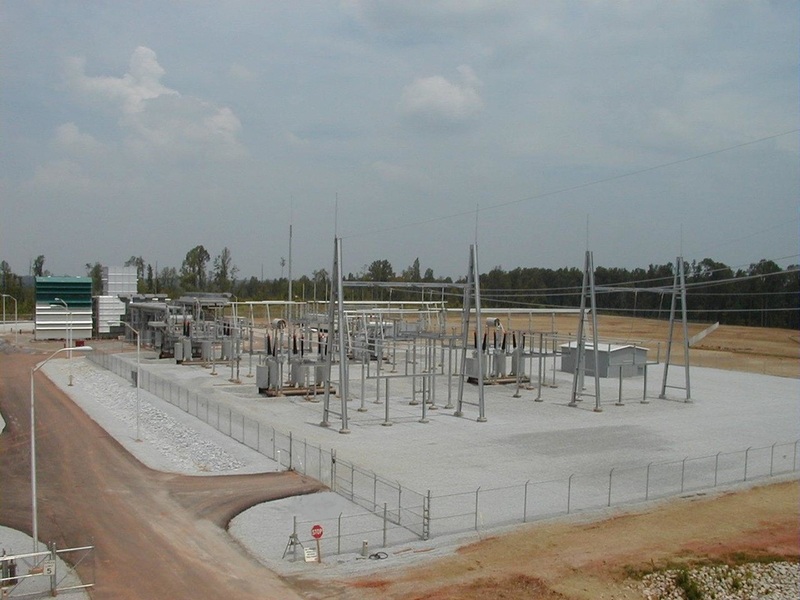 UTEC provided design, engineering, and construction observation for a 230 kV switchyard and associated transmission lines for a 180 MW gas fired turbine generator. The project included a 230/13.8 kV, 217 MVA unit connected step-up transformer, generator iso-phase bus, a 25 MVA 230/4.16 kV auxiliary transformer, three 230 kV OCBs, rigid bus low profile substation design, two 230 kV transmission lines and associated protection and control equipment. The project also included revenue metering, telemetry, and alarming using a PLC system accessed over an intranet using TCP/IP. The project was completed and ready for synchronization seven months after award of the engineering contract. This project included a five breaker 230 kV ring bus with five 230 kV transmission lines. UTEC provided complete design engineering services including protection and control for five transmission lines, grounding, site-work, control buildings and major apparatus specifications including batteries, substation structures and bus work. The project also included a 230 kV switchyard and 230 kV transmission tie for three 180 MW gas fired generators. UTEC designed modifications for the Duke University Substation 5 in conjunction with the installation of the 13 MW Central Generation Plant. Addition of 32 R reverse power relays to allow paralleling with Duke Power. Design of a new 100 kV substation with two 15/20/25 MVA transformers, five 15 kV circuit breakers, circuits switches, low profile steel structures and related protection and control for the Commissioners of Public Works in Greenwood, SC. Design of the new Wallace Road retail substation including a 100/24V 20/33 MVA transformer, two 24kV circuit breakers, and 100 kV circuit switcher for Duke Energy. Replacement of an existing 12kV four breaker point of delivery substation, modification of two outdoor switchgear substations, installation of eighty new microprocessor based relays with communications and a protective coordination study for the Cherry Point Marine Corp Air Station in Havelock, NC. Addition of a 115/12 kV 20 MVA transformer, three 12 kv circuit breakers, 115 kV Circuit Switcher, and replacement of four reclosers with 12 kV circuit breakers at the Winterville 115 kV Substation for Greenville Utilities. Addition of a 100/12 kV 12/20 MVA transformer, three 12 kV circuit breakers, to the Duke Energy Homestead Retail Substation. Design of the Protection and Control system for the new Lilesville 230 kV Switching Station including four transmission lines and one generation plant tie line for Progress Energy Carolinas. Upgrade including voltage conversion of the 115/23/12 kV Nusco Portland substation including replacement of one 115 kV transformer, installation of 115 kV and 23 kV tie breakers, and an upgrade of protective relay equipment including panels. Addition of 15/20/25 MVA transformer and three 23 kV circuit breakers to Progress Energy Carolinas’ Wrightsville Beach, NC 115 kV substation. Addition of 15/20/25 MVA transformer and one 23 kV circuit breaker to Progress Energy Carolinas’ Wendell, NC 230 kV substation. Installation of 2-new 15/20/25 MVA substations and modifications to 6 existing substations, and 69kV transmission fiber optic differential relaying for City of Salem, VA.